Last Thursday, May 11, 2015, Greg Schwartz, CFO of Zillow sent out an email with three stated purposes including lead management, rapid network growth and the announcement of a new product, Zillow Rent Connect. If you’ve not been following Zillow, with the thought that it has more to do with real estate than with property management or vacation rentals, it might be time to think again (read our blog from almost a year ago about Zillow Acquires Trulia: Implications for Vacation Rentals). From the first quarter of 2014 through the first quarter of 2015, Zillow has increased their listing partners 84% year over year. With the acquisition of Trulia in February they have become the leading network on the web with almost 50% more inventory than their next competitor. They’ve also addressed their lead quality. In order to provide the highest quality leads they have shifted their model to pay for performance. Their latest product announcement allows multi-unit property owners to boost their listings to the top of the listing result set. You can watch a video about their positioning here. The listings on Postlets are posted on social media sites and portals including Craigslist, Facebook, backpage, ByOwnerMLS, Enormo, FrontDoor, HotPads, Local.com, Lycos, Oodle, Overstock, Trulia, Vast, Yahoo! Real Estate and of course, Zillow. If you do a google search for Zillow and Vacation Rental Management, several markets are on the first page of the results. If you click through any of these links, you are taken to Oodle by Zillow with vacation rentals from hotels and private owners in this market. So in a sense, although not mentioned as a direction currently, Zillow is already in the vacation rental management business. With some additional focus, they could easily give VRBO a significant run for their money in the space, given the momentum and technology that they already have in place. For example, one recent press release stated that more than 72 percent of the listings that came in to multi-family property managers were from Zillow’s mobile technology site. 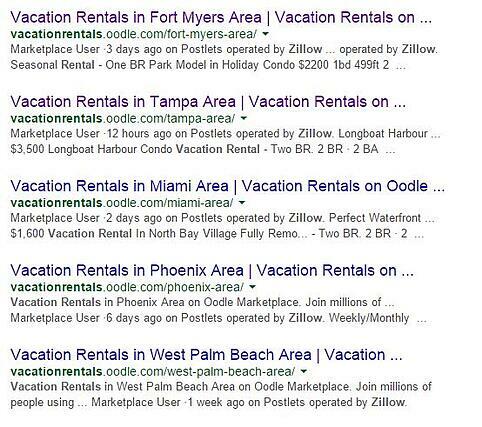 First, I think that it is just a matter of time before Zillow turns their focus to vacation rentals. If this is the case, what must the vacation rental industry and you, the company owner or strategist need to take into consideration? For those of you who are already doing long term rentals, Zillow is the dominant player in this market as evidenced above. How many of you are looking at using Zillow as a cornerstone of marketing your long term vacation properties? Finally, for those of you that have real estate companies, Zillow is the market leader. How will you choose to work with Zillow as a potential source of income and expense? Have you kept up with the latest discussions about Realtor Property Resource vs. Zillow accessing the MLS? See more about that and other potential data acquisitions on Zillow’s behalf here. As always, you’re feedback is valuable and appreciated.